In this era of plastic surgery, drugs for eternal youth, drugs for virility, drugs for youthful beauty, drugs for a youthful muscular body, drugs for sexual potency, drugs for happiness - where can we turn to learn how to age gracefully?My guidance comes from Eddie. No, not the protagonist of my book, but who he was named for - our twenty-year-old long-haired tabby, Eddie. 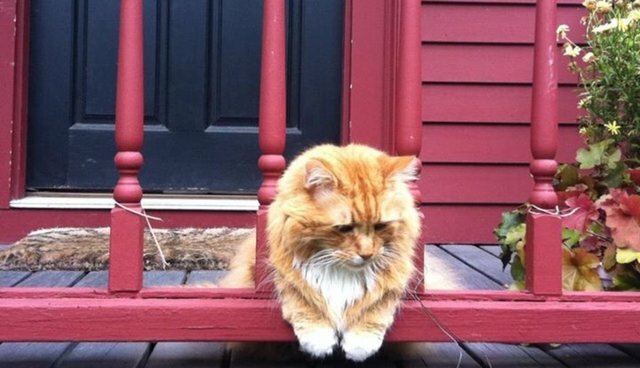 At 97 cat years old, Eddie has been the model of the wisdom of the Desiderata - "Take kindly the counsel of the years, gracefully surrendering the things of youth." In this era of plastic surgery, drugs for eternal youth, drugs for virility, drugs for youthful beauty, drugs for a youthful muscular body, drugs for sexual potency, drugs for happiness - where can we turn to learn how to age gracefully? My guidance comes from Eddie. No, not the protagonist of my book, but who he was named for - our twenty-year-old long-haired tabby, Eddie. At 97 cat years old, Eddie has been the model of the wisdom of the Desiderata - "Take kindly the counsel of the years, gracefully surrendering the things of youth." Eddie cut a striking beautiful leonine figure. He was king of the neighborhood. No Tom ever dared trespass on his property. Eddie has always loved people. He charmed the world. His particular delight wasn't just cat lovers. They were easy. He successfully converted every cat hater who entered our living room. Our vet has never heard his heartbeat because his purr was too loud and constant. Eddie is quite famous and is well regarded on Facebook. Eddie came like a dog to my wife's "Eddie, Eddie, Eddie" call. He'd come racing down the back hill like a flying basketball. And every night after fruitful hunting and god knows what, he'd climb a tree, swing over to the roof, scamper over to our bedroom window, and knock for my wife to open the awning window (that opens only at the bottom). She would then reach out and take hold of the fur of his inclined neck to pull him through the opening, and he'd then insist on endless patting. Eddie trained two collies. He'd give each new puppy two days to get acclimated. Then he'd come downstairs, fluffed out full, walk up to the excited puppy's nose and give it a closed claw whack and hiss. The dog would drop down and pee. Once it was established who was boss, they became the best of friends and companions. He loved his collies. Eddie mourned profoundly when Michaela and Zoey in turn died. When we grilled in the back yard, Eddie insisted on his own chair at the table, with his own pillow and plate, no silverware, and his fair share of the steak. He'd often contribute his own offering - a field mouse, a vole, or maybe, (unfortunately) a chipmunk. Then one day Eddie came home with a cut on his chin, which was slow to heal. We began to notice various cats hanging out on the property. He had lost a fight. Once he realized he wasn't the top cat anymore, he ceded the territory. He simply retired from his responsibilities without a complaint and accepted his new life. To my surprise he wasn't upset about it - no more fighting; no more hunting; no more running; no more running around on the roof; no more knocking on the window. He did lose his hearing. He never meowed, although he could. That was kind of beneath him. Now he lets out a banshee howl that he can't hear when he suspects my daughter's cat is around. He loves to go outside, but only when we are out there. He knows he can't protect himself because he can't hear. He still has his place at the picnic table. He sleeps a little more, you know in the Christmas box in the loft. He still loves to greet and be with people. He now sleeps all night with us, insuring his quotient of pats with a one claw insistence. He did begin losing his muscle mass. You can feel his bones now. But he grooms well and looks very handsome. We had to put a footstool at the end of the bed so he could jump up. He stopped climbing the stairs to the loft and found a suitable bed in the den and on our window seat, when he wants a private nap. He has settled into a smaller life of loving, socializing and affection. He does not look back and bemoan the loss of his old prowess. He has seamlessly accepted his smaller world with equanimity where he continues to maximize his contentment. Eddie remains as beautiful as ever.